"It is my favorite hobby to take photos and videos with my Android phone. However, before I had time to backup those new photos and videos to my computer, I mistakenly formatted the Micro SD card. Then the whole pictures and videos were deleted from my phone all of a sudden. Now I want to recover lost media files on Android mobile phone as soon as possible. Can you help me?" Well, many users haven't realized the importance of backing up vital data on their mobile phone until they get them lost. Lost precious media files from Android phone without backup? Don't worry. In this page, I'll introduce you the most practical method to recover lost media files on Android smart phone. 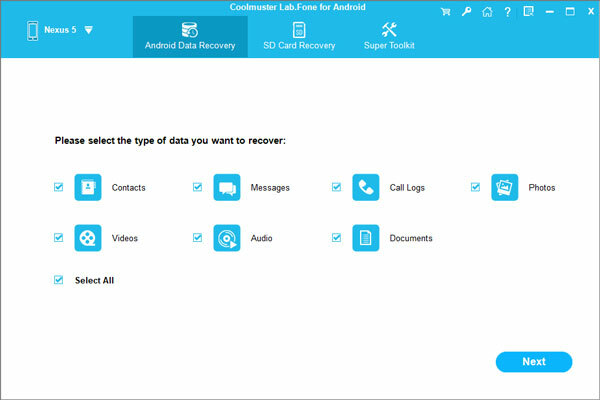 Here you should install the Coolmuster Android Media File Recovery on your computer first, which has been widely recognized as the best tool to restore deleted Android media files. With it, you can completely retrieve lost photos, videos and music from your Android smart phone under various circumstances. No matter you lose them because of improper operations, system crashed or virus infection, this program can be always helpful. After launching this Android Media File Recovery on your PC, it can deeply scan your Android mobile phone. Soon this program will display all files on the phone's internal and external memory. Then, in addition to media files, your contacts and text messages can be arranged on the menu at the same time. After that, you can touch the corresponding options to view your deleted pictures, music and videos. 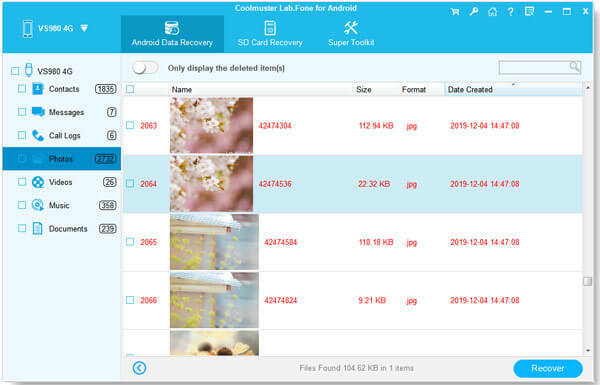 After previewing, you are able to entirely recover lost media files on Android device in a batch. That's quite time-saving. Here are two free trial versions for Windows and Mac users, please download the right one to have a try by yourself. To begin with, install and open this program on your computer after downloading. Then link your Android smart phone to the PC via a USB cable. Soon this program will start to detect your phone. If fails, you should check the tips on the main interface to continue. Then you can follow the direction below to enable USB debugging on your phone. After that, open USB storage on your device and hit the "Refresh" icon to get your phone identified immediately. In this step, you can get all lost media files listed on the menu one by one. Look at the picture as shown, your deleted photos, videos and music are arranged into different folders according to the formats. Thus you should enter the folders to view and mark your lost media files as needed. At last, click the "Recover" button at the top of the menu, it will pop up a window. Please select the output location and choose "OK". A few seconds later, your lost media files can be saved to your computer without any loss. As I've mentioned before, this Coolmuster Android Media File Recovery program can display your contacts and text messages on the interface as well. So that you can work it to retrieve contacts and messages to your computer in the similar way.